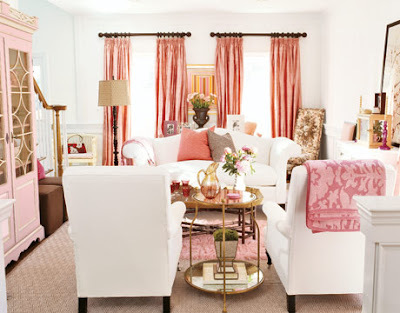 I may be treading on thin ice with today being Pink Saturday and all, but as I mentioned in an earlier post, I don't think pink is the beat all to end all color when it comes to interiors. 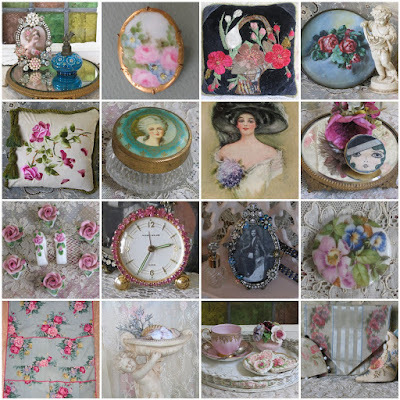 Having said that, I will admit that I have a fair amount thrown in here and there in collections, paintings, and accessories because I am a girlie girl after all. This room makes me want to curl up with a good book and just lounge! So, I guess I'm going to have to reevaluate my views on pink. Hmmmmmmm...while I mull that over, I think I'll pop on over to Bev's blog to check out the other participants in Pink Saturday. Why don't you join me? 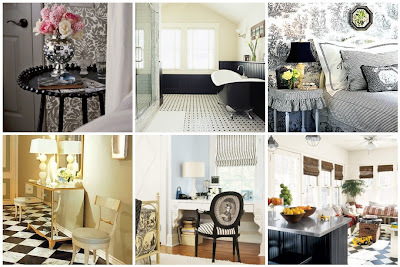 When I first started blogging, I stated a desire to share some of my own favorite collections with you. 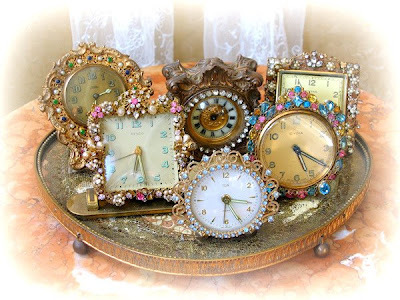 As promised, here is the first of those collections, my vintage rhinestone clocks. 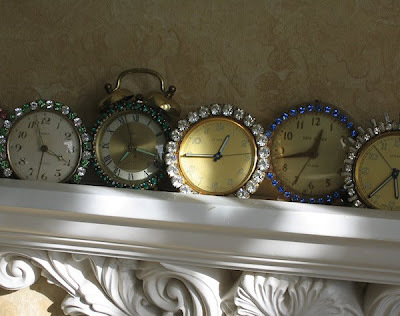 I have other clocks as well, but for now, we'll stick with the sparkly ones. This collection is one that is not only beautiful to look at, but is rather humorous to me, as well. 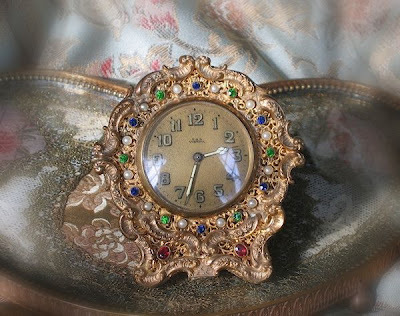 It has nothing to do with the uniqueness of the collection, because, as you are probably well aware, collecting vintage rhinestone clocks has becomes so popular, its almost a cliche'. 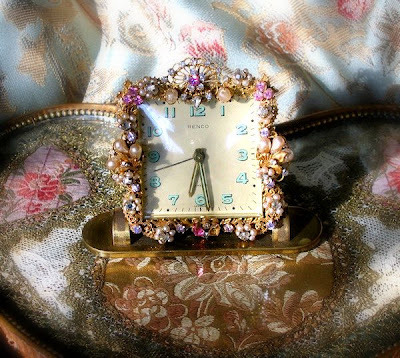 What is funny about little moi collecting clocks is...I'm always running late! My time challenge, as my husband calls it, is something that I've been wrangling with for years. Now I know its rude, inconsiderate, annoying, and sometimes all of the above to be late. I KNOW! I just can't seem to shake trying to cram too many things in too little time. On a good day, I'm not late...I'm never, and I mean NEVER early. My parents were always early, my children seem to have the propensity for being early or, at least, on time. It must skip a generation because I think my siblings also suffer from this affliction. 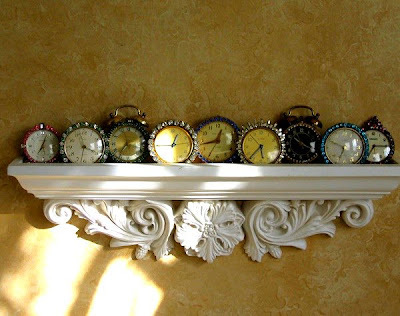 So, you can see why having clocks as one of my collections is sort of funny. But, as would be fitting, I can tell you that most of them DON'T WORK! Of course, they don't...they're mine! Above is one of my favorites from France. Love the detail on it. Another favorite...so pretty and pink. Most of the ones on the shelf are either Cyma or Semca and are from the 1940's through the 1960's. I have to say that the simple round Cyma in the center with just large clear rhinestones is one of my first acquisitions and it is still amongst my favs. Perhaps some other post, I'll share a few more closeups. When I'm not pressed for time, that is! I hoard LOTS and lots of ribbon. I have loved ribbon for years and have never quite managed to break that desire to accumulate it. Old, new, doesn't matter, as long as it's pretty. Being Pink Saturday, I thought I'd share a photo of a small amount of my stash that happened to be glorious and pink. Not anywhere near all of it and not even all of it that is pink, but you get the idea. What do I do with all of that ribbon, you ask? Well, mostly...I look at it. Once in a great while, I make a silk ribbon flower with it or use it in some way, but for the most part, it is one of those collections that brings joy just by its being in proximity to me and I periodically pull it out and touch it and love it for what it is. Okay, now I'm even scaring MYSELF! But, if you share this affliction, known as "Acute Ribbonophilia", you probably totally get what I am talking about. You should know that there is no known cure for this malady, so just embrace it and deal with it as best you can. 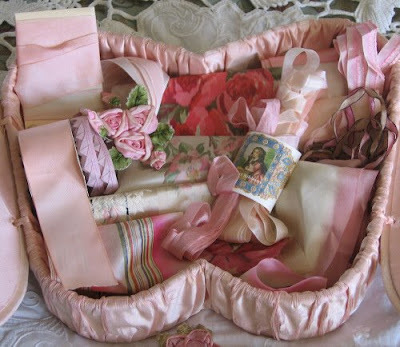 Since it is Pink Saturday, I thought I should also share with you one of my favorite pieces of all time, the pink silk box which the ribbon is in. When you are done having a peek, stop by and visit our Pink Saturday host, Bev at How Sweet the Sound for more links to bloggers participating in Pink Saturday. So, the exciting news is that we are rebuilding our garage to house cars on the bottom (duh) and a studio for our artistic and antique-y pursuits over the top (a second floor). It should be done this spring. Of course, being the decorating sort that I am, I've been dreaming of how the interior will look. Its essentially a garage apartment with a small bath and small kitchen and one biggish space. 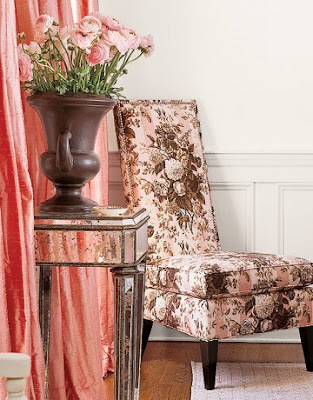 I have been pretty true to the French salon inspiration, but have been pondering the details. I have a few small French antique pieces tucked away here and there, awaiting placement when the time comes as well as some statuary and architectural pieces. I'd also like to make this space the home of my crown collection. All the while, I must also leave myself room to create and have the nuts and bolts of an art studio in place. For a long time, I've wanted to have an all white or cream and white space, but as I am out in cyberspace, gathering ideas, I come across the black and white theme. I've always loved a bit of black in every room...I think it really adds some needed punch, even in a relatively pastel environment, but this is a bit more than that. Looking at these photos, I'm starting to think there might be a change in tack. If not for the studio, then perhaps in the main house (wow, that makes our place sound so grand...believe me, it isn't!). Maybe the downstairs bathroom...maybe the upstairs bathroom...hmmmmmmmmm. Dreaming in black and white...who knew it could be so VIVID??? Well, I must get ready to go to work so this train of thought will have to be put aside for the moment. If anyone wants to send me some super inspirational links for a French salon/art studio/garage apartment, please feel free! Happy Pink Saturday! I hope this finds you well...my second Pink Saturday appearance, thanks to Bev at "How Sweet the Sound" who is hosting this event. As I was taking pictures for an item to be put on Our Cottage Garden, I said to myself, "Self, wouldn't this painting be just ADORABLE for next week's Pink Saturday?" And apparently, Self thought it would, indeed, be adorable, so here it is for your perusal. It is a painting from a gal in my local area. She does really pretty and sweet little vignettes, among other things. I love the fancy kitty in the bottom left. Cats just seem to make a house a home, but that's probably a personal bias I have...I'm a Leo, born in the year of the Tiger, how could I NOT like cats?! But I digress. The painting was just so cute and, well, PINK! 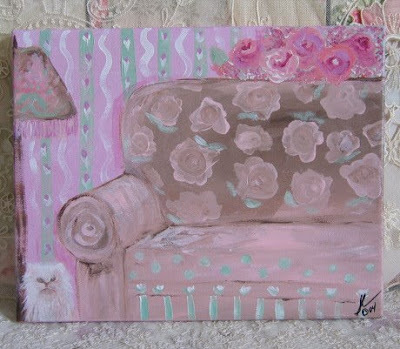 AND it had all those cozy elements like a big comfy couch, lamp, roses, and the aforementioned kitty. It evokes a smile when you look at it, doesn't it? 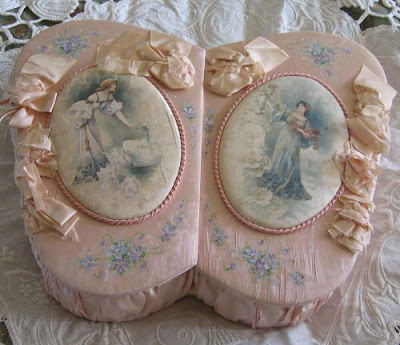 I must admit, unlike lots of ladies, I don't think pink is the beat all to end all, but I do enjoy throwing it around here and there to inject a little femininity to my surroundings (much to my boys' chagrins). A TIP FROM THE QUEEN: I do tend to buy pink tools for myself because then my husband doesn't inadvertantly take my stuff and put it in his toolbox. A big man with a pink hammer would definitely have some SPLAININ' to do to his buddies! Hey! I just got some inspiration for next week's Pink Saturday post. I have been a little lazy with my new postings...sorry folks, but that need for January organization is hitting home. 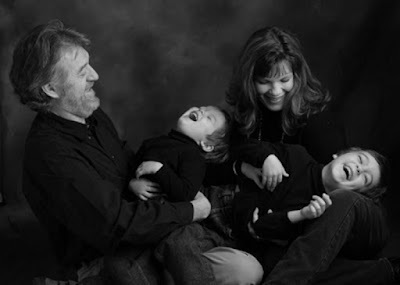 But, in looking back at my photo folders, which also need to be organized I might add, I came across one of my all time favorites of my family. It was taken a couple of years ago (or maybe 3...yikes, time flies) by a great photographer friend, Mary Lynne Ashley. It was just one of those moments that she captured and we have loved and enjoyed looking at ever since. I thought I'd share it with you today and I promise to get back to more regular postings just as soon as I can. Have a happy "humpday" and I'll talk to you soon. Last week I was cruising through Blogland and found Beverly at How Sweet the Sound who is hosting "Pink Saturday". Basically, its just a fun time where you post something (anything) that is pink that you'd like to share. I thought that sounded like a hoot, so here I am. These boots are so fun...I bought them at an antique show one time and have always loved them. What girlie girl wouldn't love these beauties??? Especially one like me who was born and raised in Texas. 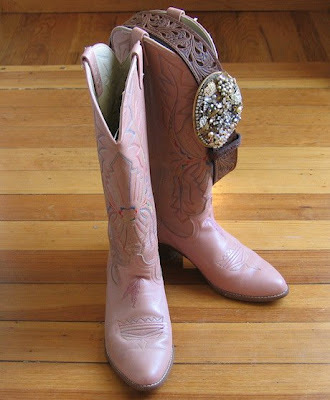 Okay, I admit it, until I moved to Colorado and started taking country dance lessons, I'd never owned a pair of cowboy boots in my life. But its not where you start, its where you finish, right? And they are even comfie, so you don't have to sacrifice happy feet for cute shoes. It's a match made in heaven if you ask me. The belt buckle is one of my sparklies that I made this year out of vintage jewels-a great way to use all of those single earrings and brooches with broken backs,etc. Be sure to pop over to Beverly's blog and check out the list of all the participants in this week's Pink Saturday as you have time this week and have a great weekend. Well, after a much needed break from my Ebay auctions, I FINALLY got all of this week's offerings put on. It seems that I'm always in a crunch to get the photos taken, pictures cropped, descriptions written. I know I should be more organized, but the fact of the matter is, I'm just not. I'd like to think that in 2009, the Organization Fairy will suddenly descend upon my life and fix everything that is, shall we say, not working to its optimal capacity. Sigh...a girl can HOPE can't she? One year, I discovered the Fly Lady, http://www.flylady.net/. It was a true revelation. I did, indeed gain a great bit of organization that year, but then the next "thing" came along that derailed me (I don't even remember what) and I scrapped her bits of sage wisdom and fell back into my old bad habits. Do you all have these problems with being overbooked and underdisciplined and overwhelmed with life? I will qualify this question by saying that I am living the life I love for the most part, its just the details that sometimes make me crazy. Please send me a comment and let me know that I'm not alone out here in Disorganizationville! In the meantime, here's a mosaic of this weeks' offerings. 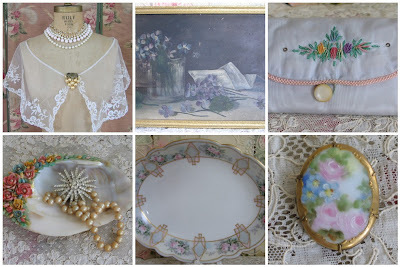 There's an antique French net lace collar, a lovely Victorian painting featuring pretty little violets, a neat silk embroidery embellished vintage sewing kit filled with notions, a really cool shell that is decorated with shell roses, a handpainted serving dish featuring beautiful pink roses and dated 1915, and a handpainted brooch featuring gorgeous pink roses and blue forget me nots, circa 1900. You can reach my auctions by clicking the button on the left sidebar of my blog, should you be moved to do so. Otherwise, just enjoy the photos and have a great day! Click anywhere on the mosaic to see a larger version of the pictures. As I sit here trying to figure out how to balance working at my "real" job this weekend, visiting with my long lost godson who is visiting from out of state, and returning to creating new Ebay listings after a 2 week break, I got the urge to share with you some of my favorite Ebay listings from 2008. I enjoyed doing the mosaic for My Romantic Home's End of Year party so much, I decided to create some more. I only sell what I would love to have in my own home, so, while it makes it fun to shop, it does sometimes make it hard to sell. 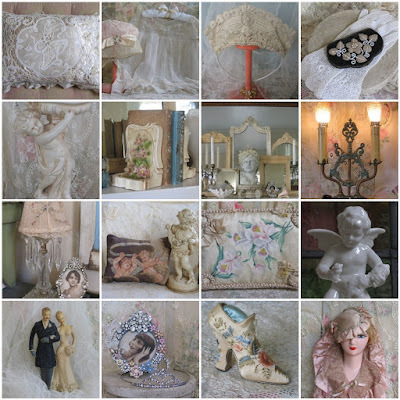 I'm glad to have my photos to refer back to since it does help me to feel like I still have some piece of these beautiful items which have since gone on to different homes. I have a definite "look" that I sell and I find that helpful when shopping because I love LOTS of different antique things. If I didn't limit my purchase choices, I'm afraid I'd have more than I could EVER list! That being said, I should get these tired bones to bed so I can make the most of the time I have this weekend and get some pretties listed for Sunday evening. Okay, after I watch the "Best of" show on HGTV with Candice Olsen-she is SO WONDERFUL. If you haven't caught "Divine Design" on HGTV, check it out at http://www.hgtv.com/divine-design/show/index.html and see when its on in your area. In the meantime, enjoy the photos. BTW, you can click anywhere on the mosaic and it will enlarge the whole thing so you can see the pictures better. Best wishes for a healthy and happy 2009!